Unlike the other great 19th-century Russian author, Dostoievsky and his peasants and scallywags, Leo Tolstoy examined the elite. 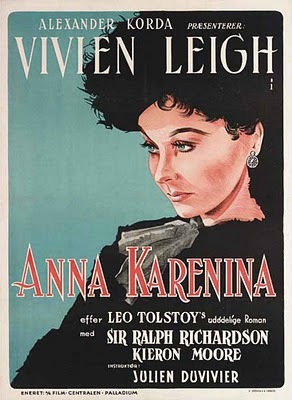 Anna Karenina is the tale of a Russian aristocratic class being turned upside-down by the import of Western morals. Anna and her brother, Stepan, are both having affairs outside their marriages. Soon enough, Anna becomes pregnant with her suitor Count Vronsky's child. She tells her husband, Alexey, who coldly worries more about his social and business reputation, determining that a divorce would only disgrace him. Vronsky, meanwhile, is desperate to be with Anna. He attempts to kill himself. Finally, Anna decides to run away from St. Petersburg to Italy with him. They birth a healthy little boy. Soon, they return to Russia, but find themselves ostracized. This causes them to fight, she accuses him of being unfaithful, and she begins to take morphine as a way to cope with her increasingly troubled life. The sad story ends with more fighting between the two lovers, and Anna kills herself by jumping in front of a train. Anna Karenina is almost farcically tragic, with new problems appearing for most of the characters around just about every turn. It is an early tale of the growing pains of globalization.